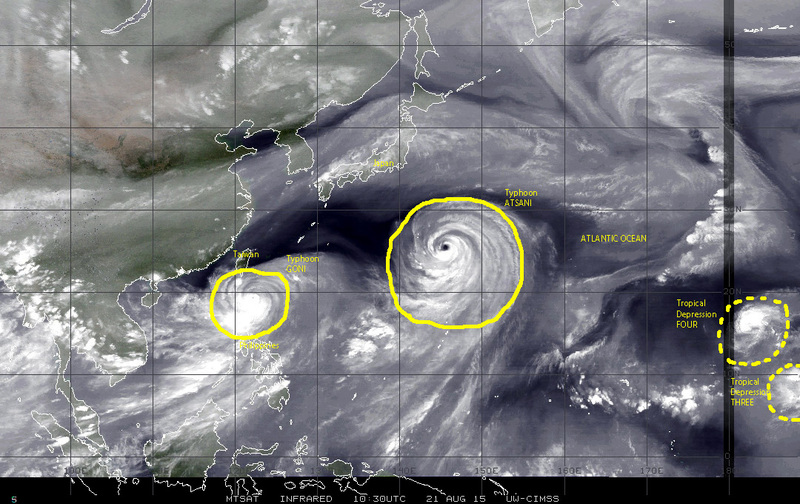 It is a trio+ in the Pacific! The ‘twin evils’ of typhoon GONI and ATSANI continue moving over the northwest Pacific Ocean. Typhoon GONI brushed past the northern Philippines and Taiwan and it is now aiming for southern Japan and the Korean peninsula. Typhoon ATSANI has made a turn toward the north and now the northeast as it continues to track parallel to the east coast of Japan posing no direct threat to land. This cyclonic activity over the northwest Pacific is now joined by tropical storm LOKE to the west of Hawaii over the central Pacific ocean, which has seen plenty of disturbed weather activity in recent days, as a swarm of tropical waves and disturbed weather cells move westward after being generated over the eastern Pacific off the coast of Central America and Panama. Color-enhanced infrared satellite image of 08/23/2015 showing several tropical waves and disturbed weather cells extending from the eastern Pacific off the coast of Central America and Panama to the central Pacific near Hawaii, where Tropical storm LOKE is now active and moving NNW toward the island of Midway. While it would appear the west-northwest Pacific basin is having an extremely busy 2015 season in terms of tropical cyclone generation, the reality is that there have been a total of seventeen tropical cyclones affecting the region since MEKKHALA developed in January of this year and hit the Philippines until typhoon ATSANI formed this August. This kind of cyclonic activity is not unusual for that region and it is in fact somewhat below average. We need to wait and see what the next few weeks bring in terms of cyclogenesis to determine what kind of a season 2015 will be in the northwest Pacific ocean. The northern hemisphere tropics are seeing plenty of cyclonic activity on this Friday 21 August 2015. 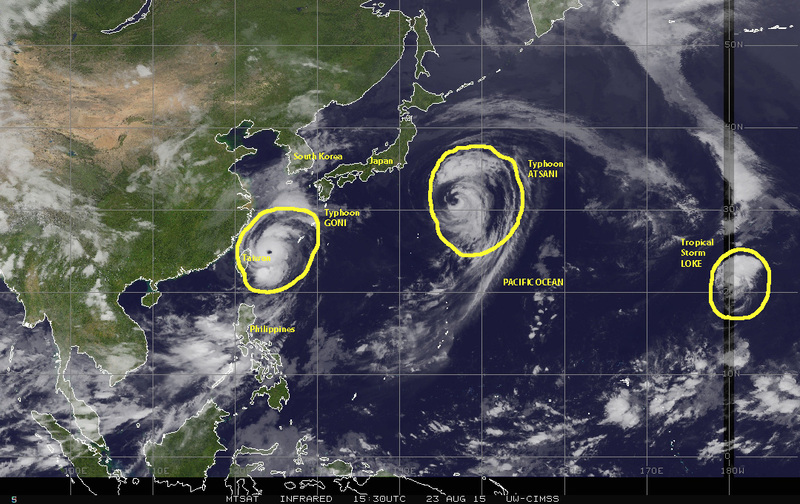 Over the Pacific basin strong twin typhoons GONI now moving between the Philippines and Taiwan before an expected turn toward southern Japan, and ATSANI approaching southern Japan and beginning to also turn toward the north. 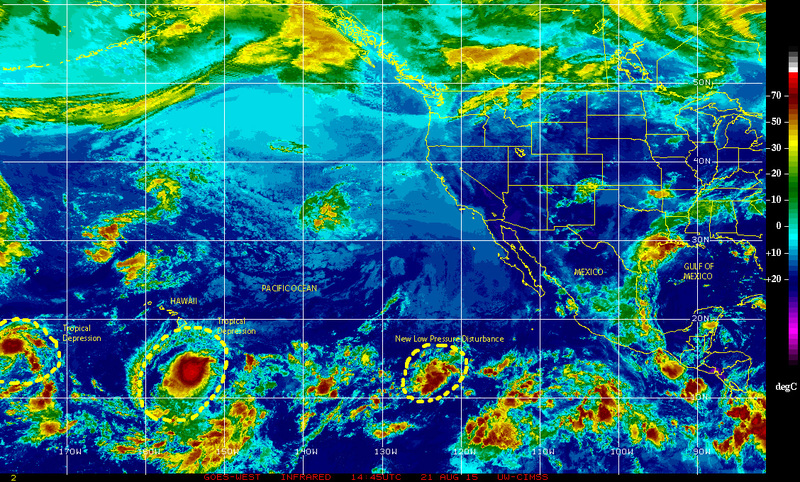 Also in the Pacific there are twin tropical depressions THREE and FOUR in the vicinity of the Hawaiian Islands. 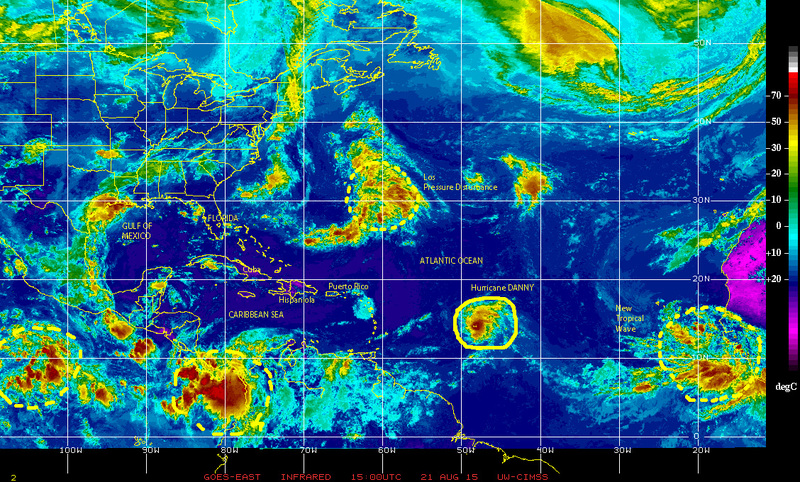 Except for DANNY and GONI none of the other active cyclones pose any danger to land for now. Stored heat in the tropical northern oceans is quite high now, so one important contributor to cyclogenesis is present waiting for other triggers that may generate future tropical cyclones as we reach the historical peaks of hurricane seasons in these basins. Color-enhanced infrared satellite image [NOAA] of 08/21/2015 showing a now Category 2 Hurricane DANNY, the low pressure disturbance being investigated by the NHC near Bermuda, and a new tropical wave just emerging over the eastern Atlantic south of the Cape Verde Islands and also being investigated by the NHC! The 11:00 A.M. National Hurricane Center (NHC) advisory brings important new information: (a) Hurricane DANNY is now a category 2 tropical cyclone in the Safir-Simpson hurricane wind scale, packing maximum sustained winds of 170 kph; (b) a new and large tropical wave is emerging over the eastern Atlantic waters south of the Cape Verde Islands, which warrants further investigation and close monitoring; (c) Over the eastern Pacific a new low pressure disturbance off the coast of Mexico is also being investigated by the NHC. 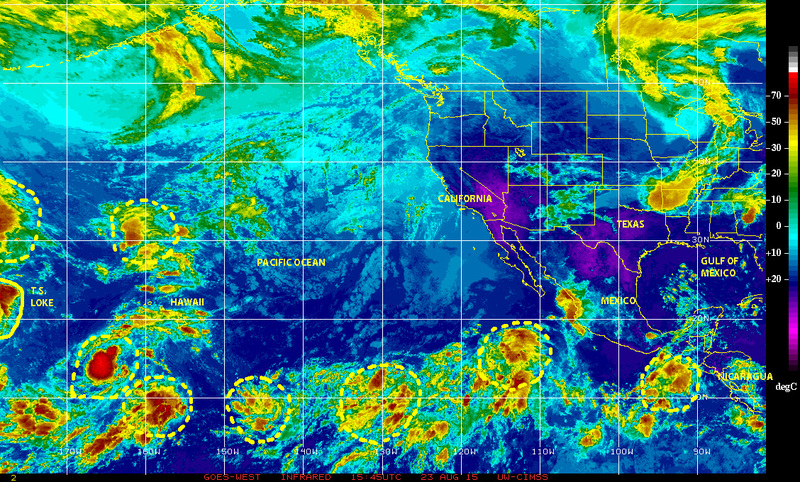 Cp;or-enhanced infrared GPES-West satellite image [NOAA} of 08/21/2015 showing a new low pressure disturbance over the eastern Pacific, now being investigated by the NHC.